Several Gateworks products support SATA and mSATA. mSATA cards are miniPCIe form-factor (electrical and mechanical) cards that use SATA signalling on the PCIe signals and typically use flash based storage (Solid State Disk or SSD). Many of the Gateworks Ventana boards support mSATA. Because mSATA routes SATA signals to a miniPCIe socket, these boards use a software controllable mux to decide if mSATA or PCIe should be routed to a specific miniPCI socket on the board. The bootloader 'hwconfig' command (see here) is used to configure this mux at boot time because if PCI is desired, the bus is enumerated only once at boot time. Drives are currently available from a variety of manufactures including Toshiba, Samsung, HP, Intel, SanDisk and Dell. The selection between the standard PCIe interface and the mSATA interface is under software control using the i.MX6 GPIO:DIO digital I/O signal, which is configured by the bootloader on powerup via the 'hwconfig' command. SATA 1.5 Gb/s and SATA 3.0 Gb/s speed. The GW2388 includes a SATA factory ordering option. This option adds a Serial ATA data connector for supporting SATA 1.5Gbps Generation 1 and 3Gbps Generation 2 speeds. The SATA port is compliant with Serial ATA 2.6 and AHCI 1.1. 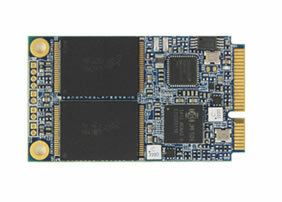 Various cards exist that implement a SATA interface over the PCIe bus. This is standard Linux procedure that is widely documented on google. Partition the drive using fdisk. Example shown below.